This may be one of the most simple posts ever, but it is near & dear to my heart. I follow this recipe almost every morning as a beloved part of my routine. My roommate thinks I have problems, and if I’m gonna be honest, I do. I have a full-on addiction to coffee. I have a french press, so this process is pretty simple for me, but with a traditional coffee maker it might be a little more involved. Okay I’m going to be lame, and direct you away from the blog. These directions from Stumptown Coffee Roasters for a french press are thorough and clear, and they have done a way better job of explaining it than I could. The only adjustment you need to make is to add in the spices during the brewing process. This tiny step adds a layer of flavor that doesn’t overpower the coffee, but adds an element of warmth and coziness that is hard to beat. I would highly recommend trying this or any other combination of spices that you enjoy! A big mug of this on a cold morning, with a good book and a fire in the fireplace is my idea of heaven. Please try this the next time you get a chance! 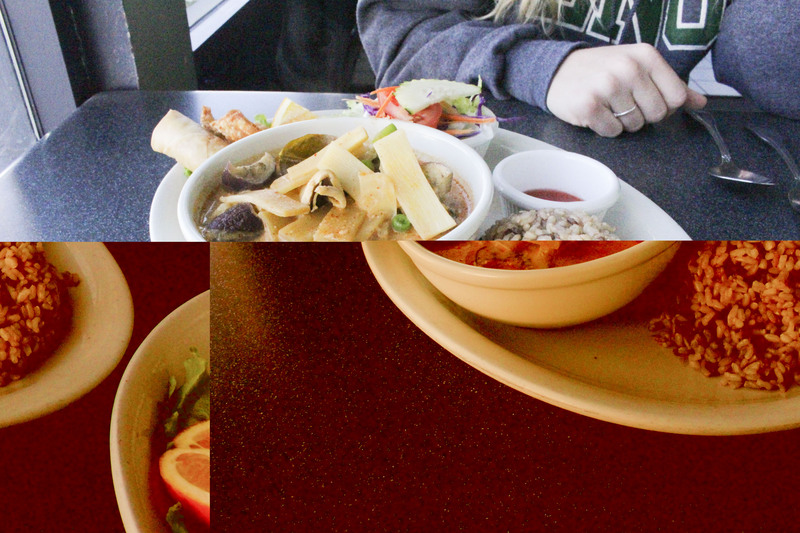 This week, Emmy and I decided to reward ourselves with a trip to get Thai food, and I decided to document our experience to share this week! 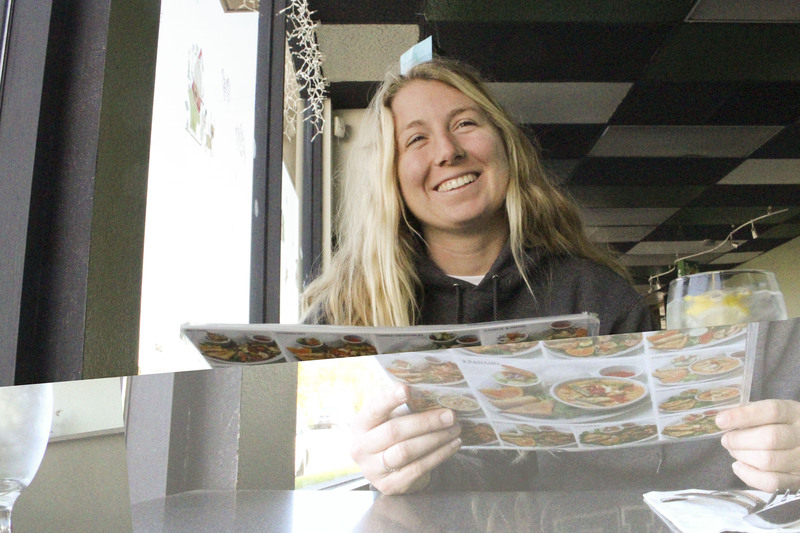 We went to a little spot in Ocean Beach called “Thai Time” that neither of us had been to before. The restaurant itself wasn’t overwhelmingly beautiful, but overall we were very happy with our experience. Can you tell from this picture? We were lucky enough to catch their lunch specials, so we decided to get two entrees and split them. She ordered the red curry, and I ordered the spicy noodles. I’m no connoisseur of curry, but our dish was tangy, sweet, salty, and creamy just like I wanted. The amount of japanese eggplant, and bamboo shoots was slightly overwhelming for my taste, but the flavor was delicious. We ordered the brown rice, and chicken as our protein, so the dish was very filling. The spicy noodle dish was quite tasty as well. We both decided that a dish with “spicy” in the name might be expected to hold more of a kick. The fresh, bright basil and rich sauce were well balanced, and just what we were hoping for. When all was said and done, we decided that this wasn’t our favorite Thai spot, but for the value, location, convenience, and service, I could definitely see us returning. 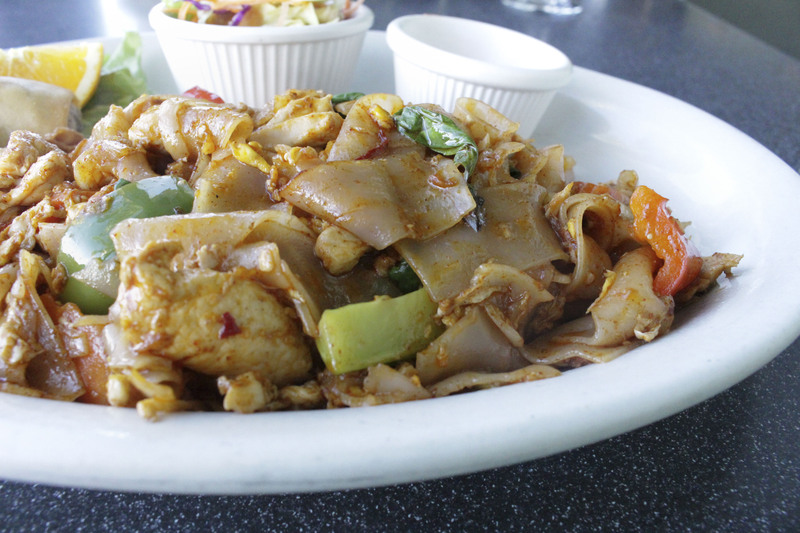 What’s your favorite Thai restaurant? I would love a good suggestion! Can you tell I like cookies? 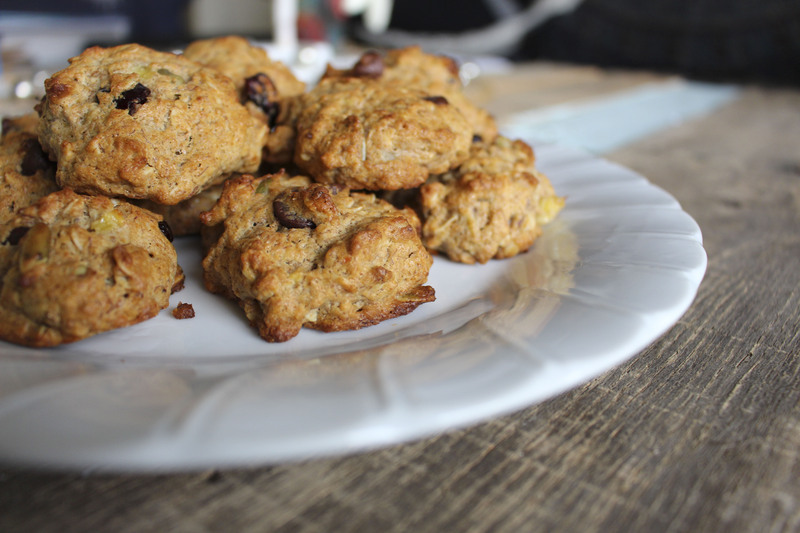 This awesome recipe comes from my lovely friend Emmy (you’ve met her a few times). She has gotten into the habit of making cookies out of absolutely anything and they end up tasting amazing every single time. I’m pretty sure it’s sorcery, but whatever. Anyway, we based it off of the classic tollhouse recipe, but it’s basically as far from the original as you can get while still needing to site it. Do I even need to give you the link? I’m pretty sure most of the world has it memorized by now, right? ha. Just kidding. Here it is. Follow our little recipe for a fun new twist on an old classic! Mash bananas, then combine all wet ingredients in a bowl. When those are combined, add in the dry ingredients and stir until combined. I would recommend saving nuts, dried fruit and coconut to incorporate after the rest of the better is mixed well, but we ended up dumping it all in at once and it turned out alright! Place spoonfuls of dough on cookie sheet (ours were a little over 1 inch in diameter, but you can do whatever size you like). 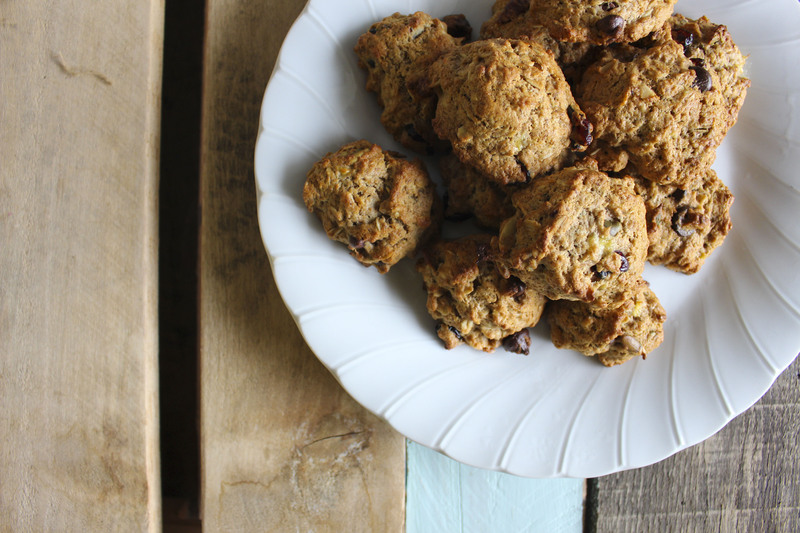 These cookies are lightly sweet, soft, moist, chewy, and crunchy, all at the same time! I was pleasantly surprised by how satisfying they were. With the whole wheat flour, nuts and bananas they were quite filling as a little afternoon snack. 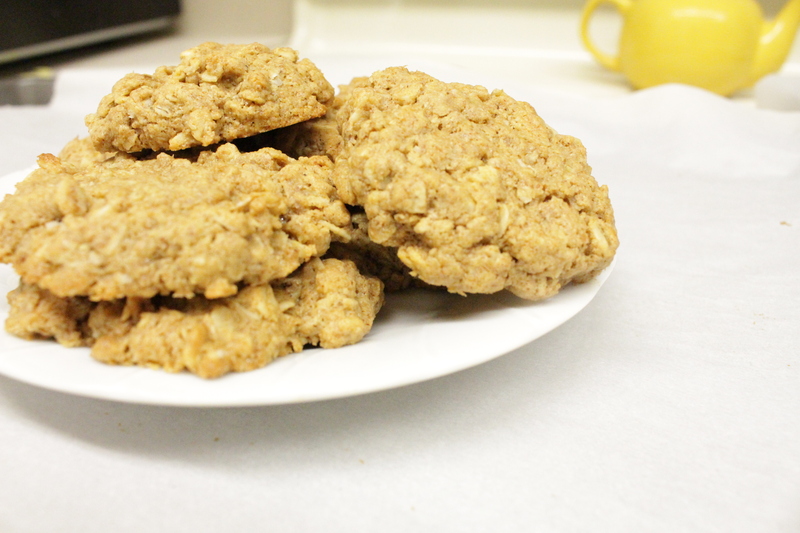 I may try making them a bit bigger & adding more oats to turn them into actual breakfast cookies next time. I’ll let y’all know how they turn out! Combine all wet ingredients in a bowl. When those are combined, add in the dry ingredients and stir until combined. Place balls of dough on cookie sheet (ours were a little over 1 inch in diameter, but you can do whatever size you like). Press down lightly. You can even add the traditional cross-hatch that peanut butter cookies have if you’re feelin’ fancy! They turned out to be very tasty little cookies! This was one of the few recipes that I was doubting slightly as we put it in the oven, but I was happily surprised by our result. They were very easy to throw together, and I can definitely see myself making them again. If you get a chance, try them out! They’re bound to put a smile on someone’s face. There are a few different treats that are an absolute must have during Christmas time for me. 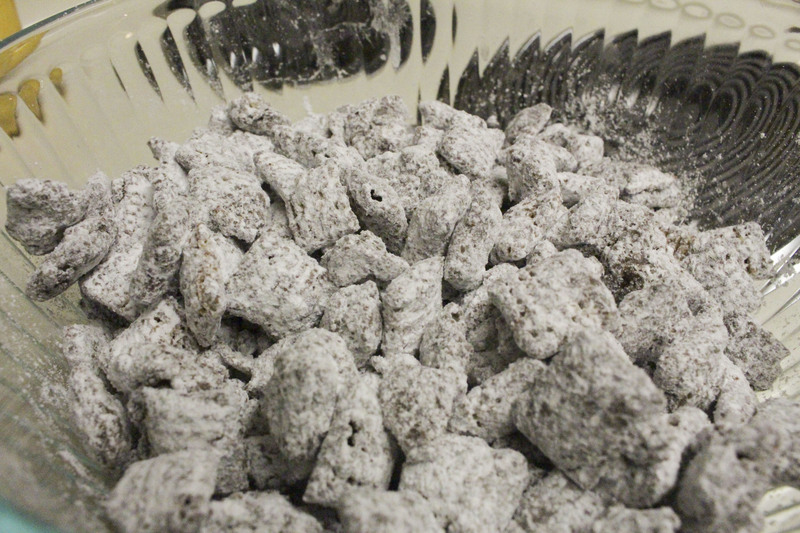 One of those is definitely “puppy chow.” Most people are familiar with this sweet, salty, crunchy dessert, but if you are one of the sad folk who have never tried it, now is the time. It’s super simple to make, and is becoming a bit of a tradition with some of my friends. 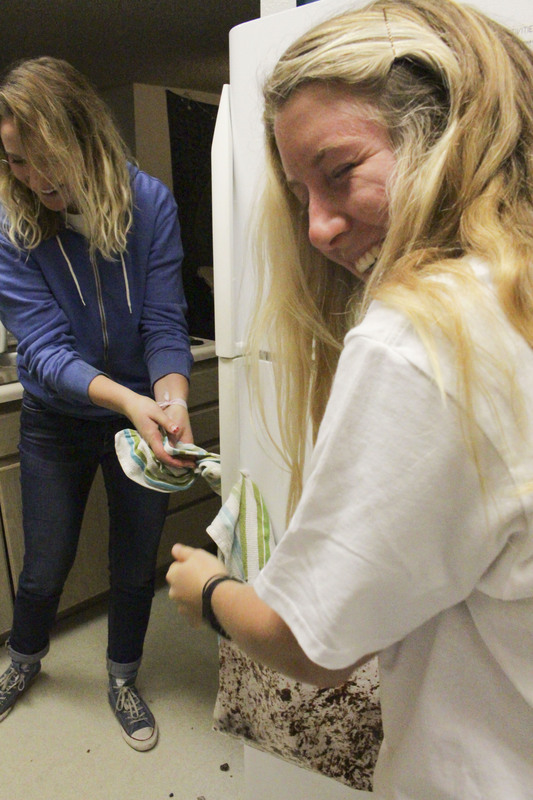 This marks the second time that mcKensey, Emmy and I have attempted to make puppy chow, and it’s also the second time it ended less than perfectly. Last year, they missed the memo that you’re supposed to coat the chex cereal in the chocolate mixture before adding the powdered sugar. It tasted fine, but looked slightly less than appetizing, and had a few solidified hunks of the chocolate mixture dispersed throughout. Not really the worst thing on earth. This year was even better though. Emmy was having a grand ol’ time mixing everything in a plastic zipped bag when suddenly the entire contents of the bag ended up on our kitchen floor. Apparently she just got a little too vigorous with her mixing technique? Luckily we had just cleaned the floor, and the parts on the top were okay to eat. Five second rule, right…? 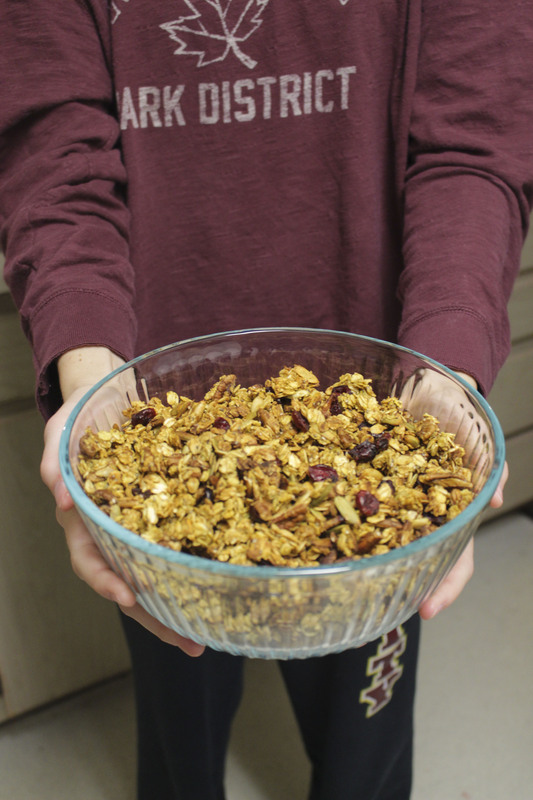 Measure out cereal into a large mixing bowl. Melt chocolate chips and stir in peanut butter until smooth. Our peanut butter was slightly dry, so we added about 1 tbs. of butter. This step may not be necessary, but it added some needed smoothness. And it’s butter, so obviously it made it taste really good too. Once the mixture is smooth, combine it with the cereal and stir until the cereal is evenly coated. Pour half of the sugar into a ziplock bag along with half of the cereal. Mix together until evenly coated. Be careful not to spill the entire contents of the bag on the floor. *cough, cough* Emmy… Repeat this step with the other half. +You may need more/ less sugar depending on the consistency of the chocolate mixture. This recipe only takes about 15 minutes from plain ingredients to finished product and clean kitchen. It’s definitely a nice way to get a treat and a quick study break in! I would highly encourage any college students out there who are struggling through finals right now to give this a try. 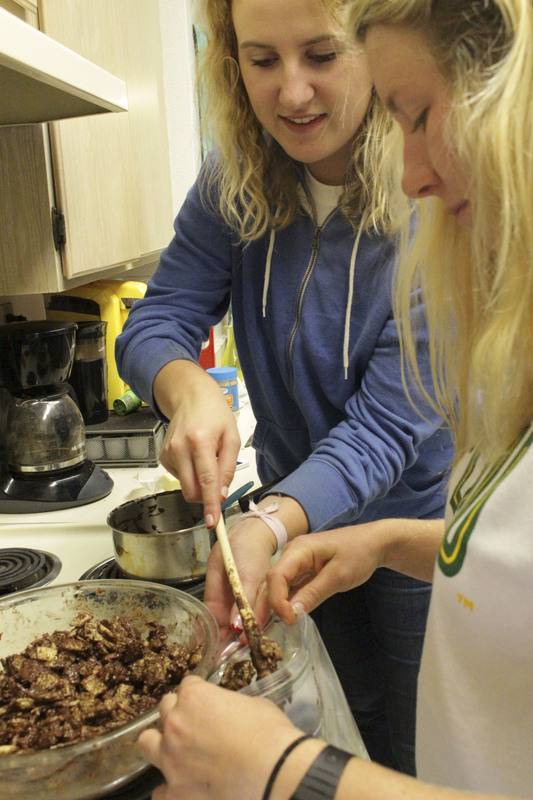 Even if you completely mess the recipe up, it’s bound to create some laughter and memories. 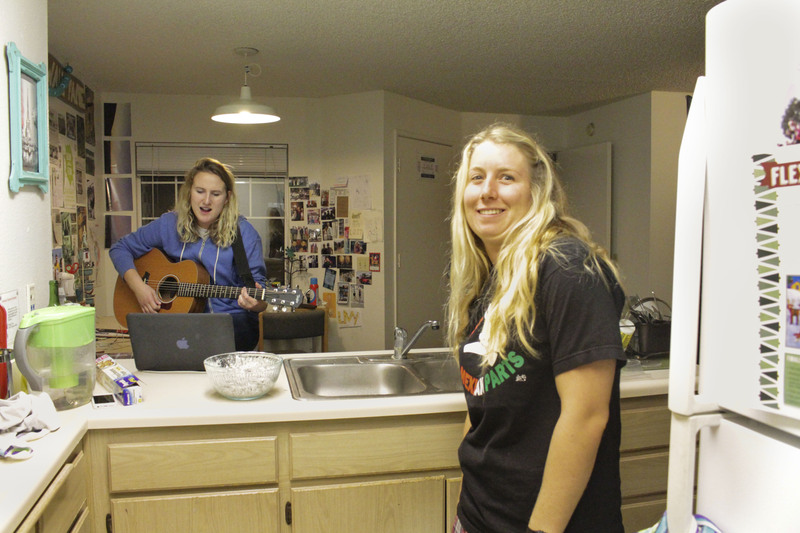 After cleaning everything up and finishing our recipe, we had a nice little jam session which added even more fun to the experience. The view from my spot at the stove. As thanksgiving break approached, I was getting very excited to go home and spend the majority of my time in the kitchen. Being at home gives the feeling of having an endless supply of ingredients and materials, which mean the possibilities are endless! Unfortunately I came down with a pretty nasty cold that drained all of my energy. I also have a slight “germaphobe” for a father so I was essentially banned from any food preparatory activities. Eventually I started feeling better and made it back to my apartment with a strong desire to sit on my couch in some cozy blankets with a warm drink. I haven’t had a taste for my usual cup of black coffee, and I’ve probably gulped down about 50 cups of tea (no joke) this week so I was looking for something else to satisfy my craving. If you like strong coffee, I suggest using espresso. 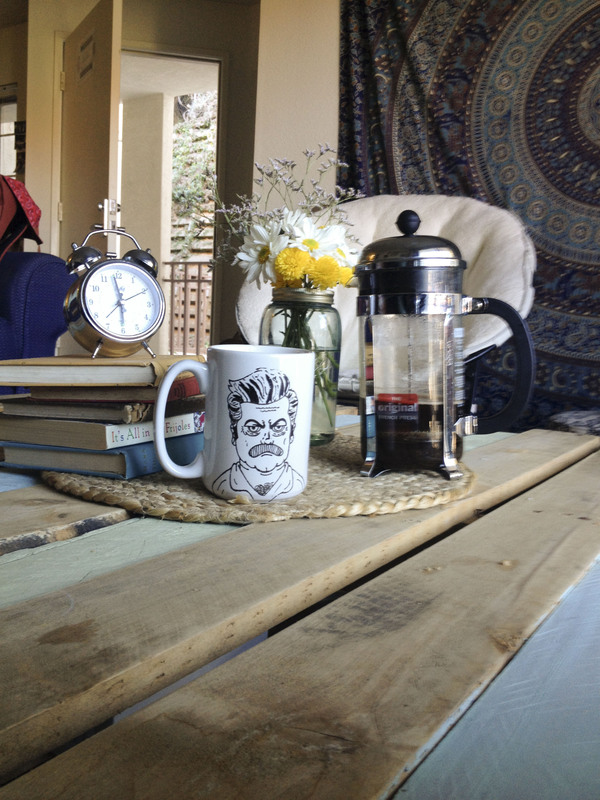 If you’re like me and don’t own an espresso machine, I would brew some coffee in a french press with about 1½ times the amount of grounds you usually use. Also, if you’re using a french press, I suggest adding the bulk of the spices (cinnamon, nutmeg, pumpkin pie spice, or whatever you choose) in with the beans so it steeps into drink rather than leaving a weird texture at the bottom of your mug. After combining and heating all of the ingredients in the pan, I suggest running it through a strainer before either blending it or frothing it. I haven’t tried this yet since I don’t have one *hint, hint Christmas is coming* but there’s always a sort of thick pumpkin residue at the bottom of the mug. It’s definitely a nonessential step, but I think it would add a nice touch. If you like froth, you should definitely throw this into a blender. I personally can live without it on most drinks, so I skipped that step. The recipe that follows is exactly how I made it today, but based on the little notes above, you can really throw it together however you’d like! 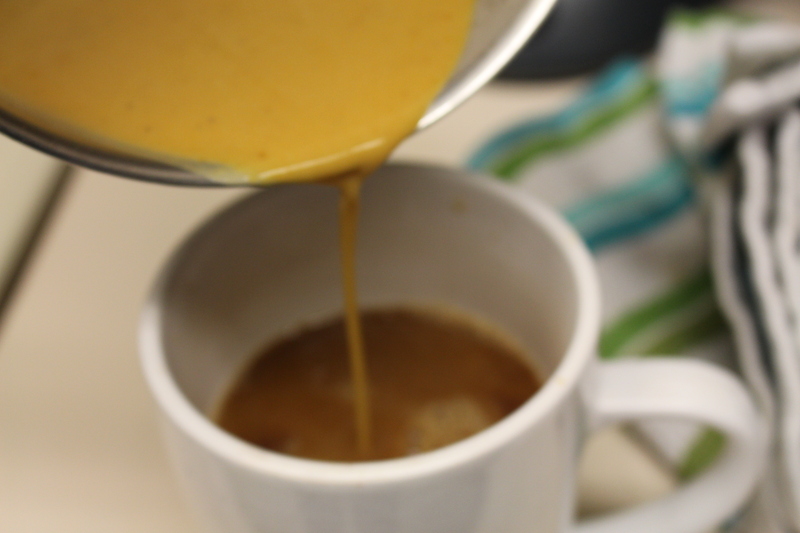 In a cup or sauce pan, mix together almond milk, pumpkin puree, honey, spices, and instant espresso. Cook on medium heat on the stove top or (microwave for 30-45 seconds). Add spices into a mug. Pour brewed coffee over spices. Pour pumpkin mixture over coffee. Sprinkle with cinnamon and enjoy! I must admit, this wasn’t the most beautiful version, as it has a orang-y/brown color, but it felt like drinking a cup of fall. I needed a little moment of peace, and this really delivered. 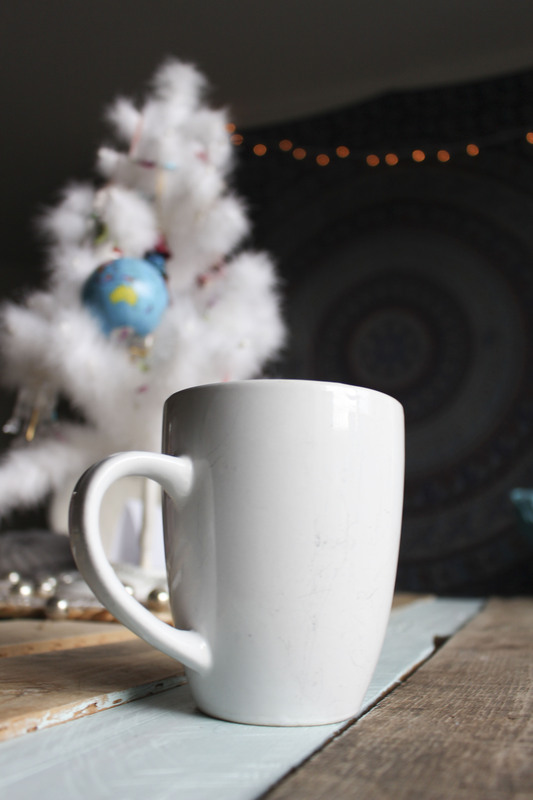 If you find yourself overwhelmed by the chaos that can fill this time of year, I suggest you make yourself one of these, grab a blanket and a book, and curl up on your couch. It’s worth every second, every penny, and most certainly every calorie. I can’t even properly express how much I love this recipe. These are a few of my favorite things: granola, pecans, pumpkin, honey, cinnamon, nutmeg, crunchy things, fall, warmth, food. Hailey holding the precious bowl of golden goodness. This recipe provides all of those things. I love it so much that as a write this post, I’m making a second batch. (The first batch was made 2 days ago and it’s already gone). I begrudgingly shared with roommates, neighbors, and friends, and it was unanimously adored. Although it is just one more recipe in a long line of pumpkin-themed dishes, it really is worth a try. I based it off of this recipe from one of my favorite blogs, “Minimalist Baker.” I didn’t feel the need to alter it too much, but I used honey instead of maple syrup (since that’s what I had on hand) and added a couple extra ingredients. Whichever recipe you go with, I am confident you will enjoy. 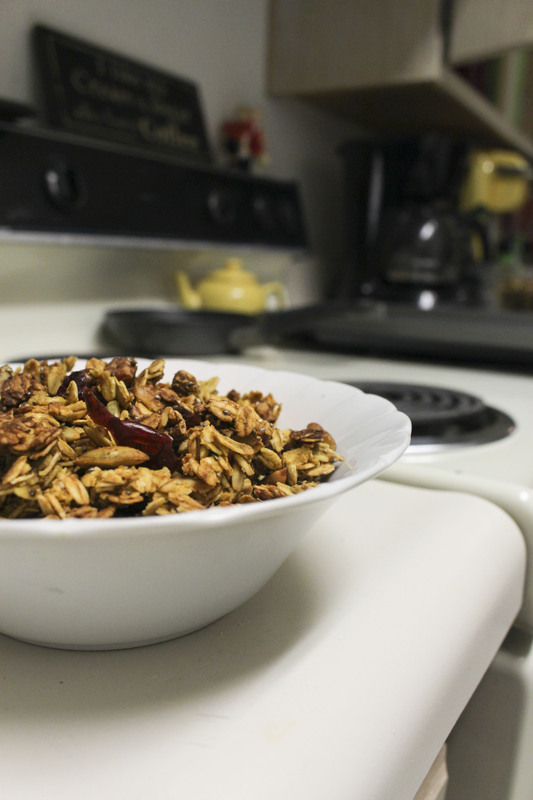 Preheat oven to 340* F. Mix the oats, nuts, seeds, spices, and salt together in a large bowl. In a small saucepan over medium-low heat, warm the coconut oil, honey and pumpkin puree and stir. Take the pan off of the heat and add vanilla. Pour over the dry ingredients and quickly mix with a wooden spoon. 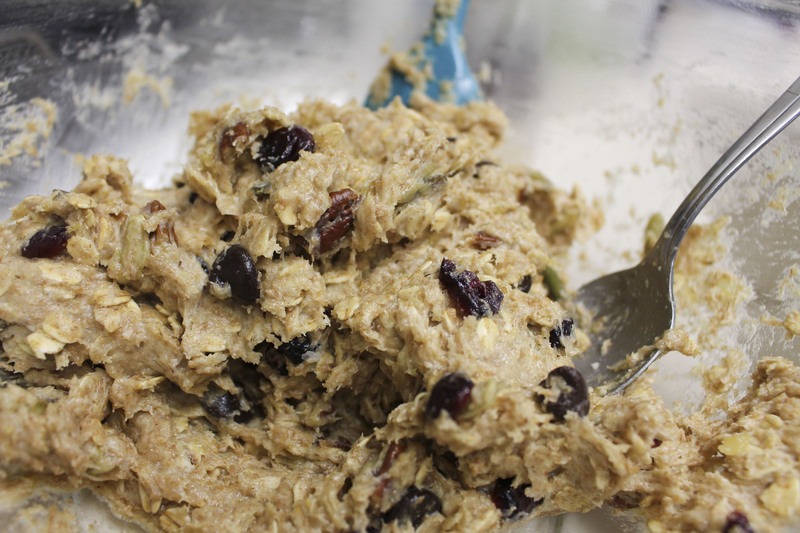 Spread the mixture evenly onto two baking sheets and bake for 10 minutes. Turn the pans and/or switch between the top & bottom racks. 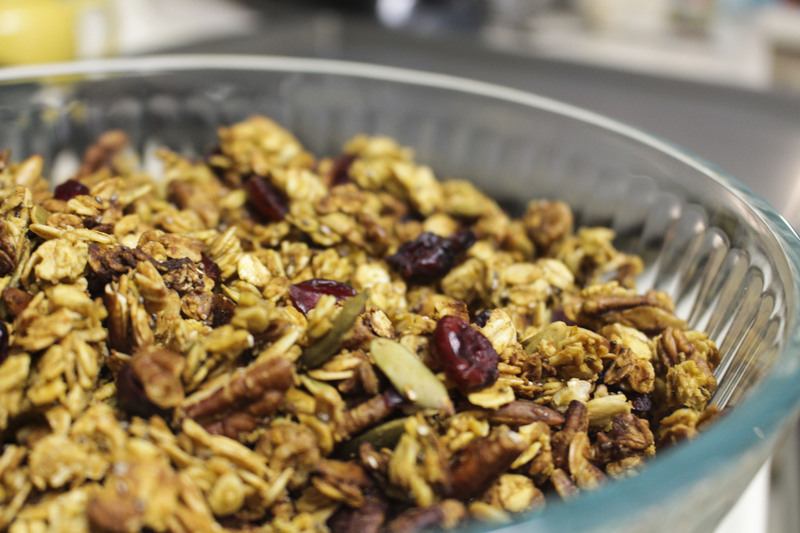 Once the granola is golden brown (about 20 minutes in my oven), remove from oven and let cool completely. Add in dried cranberries and store in an airtight container. I recommend serving over yogurt or ice cream, but it’s good enough to eat by the handful! A bowl full of fall. This stuff won’t last for very long, so if you have a lot of people coming in & out of your kitchen, I would make a double batch. Once again, this can be totally customized to suit your tastes an preferences. Let me know if you come up with any other additions! This little guy went to the neighbors and lasted about 15 minutes before they needed a refill.